What do Butterflies and Poop Have in Common? They’re Green! First, if you’ve never had green poop, congratulations, you’re one of the few people who haven’t had the issue … apparently. Anyway, I’m getting ahead of myself. We got this question from Facebook, and it specifically asks if Malachite butterflies use chlorophyll to produce its beautiful green color. As you might have guessed from the title, no. Nope not chlorophyll, but, probably, bile and xanthophyll. I’ll start with this. I scoured the internet for a few weeks to see if I could find any examples of butterflies, or even insects using chlorophyll for their pigment. And while I found one blog that entertains the notion, I couldn’t find any peer reviewed literature on the topic. There are two main ways to be green if you’re a butterfly. But I want to talk about both, so if you see a majestic butterfly flapping about you can make an educated guess for how it got its color. But firs thing’s first – we gotta be a butterfly first. Last week, I had a really great question about what *actually* happens inside of the cocoon. So I’d start there if you’re genuinely curious, because here I’m just going to cover how butterfly scales are made. Butterflies, are in the order “Lepidoptera” and chopped up from its Greek roots means “Scale (Lepido) Wing (Ptera)”. And that’s because the thing that makes butterflies and moths, butterflies and moths, is that their wings are covered in little scales. Like lizards. And this is where all the action happens that makes you go “oooo Wow!” when a spectacularily colored butterfly crosses your path. Time to pump those wings up. If you’re the type of butterfly that makes color with nano-structures, then your scales are elaborately formed to play tricks with the light. Scale formation begins inside the chrysalis and if you’re the type that deposits pigment in your wings, it happens during the secretion of the wing scales (H). Usually. Oh, and yes, when the butterfly emerges, it has a super big abdomen, and stubby little wings that it proceeds to pump up with blood, like a balloon, over the course of a couple hours. There’s only a few here you have to pay attention to. F. Socket secreting and scale secreting cells differentiate. The first way you can make green is through nano-structures. If you ask most people “how butterflies are green” they’ll probably respond with this. Nano-structures make morphos blue, peacock feathers iridescent, and several other butterflies green. This is an amazing feat of engineering because the scales are completely clear – we only perceive color because of how light bounces out of them. This is the most commonly employed nano-structure to produce not only iridescence, but a stunning array of colors. This method is used by peacocks and hummingbirds, in addition to butterflies and moths. You can see how the colors change from turquoise to green and back again. In this case, the scale structure looks like a little bowl and color production depends on the width and depth of the dish. This is how this Peacock Swallowtail (Papilio blumei) makes that greenish-blue-phase shifting green color. In this case, light that bounces into the dish, and straight back out is green light, which is why if you look at the butterfly straight on, it looks green. Light that comes in at the edge of the dish, bounces to the other side, and comes back out as blue, which is why if you look at it from an angle, it’s a kind of blueish-turquoise color. Here’s what those little dishes look like. Note the scale bar … really *really* tiny. The second common option is to make gyroid structures. 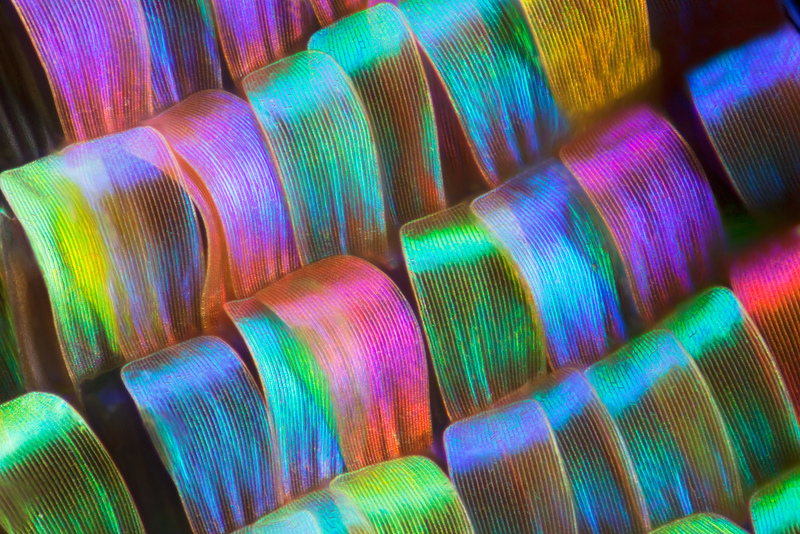 These complicated structures are called “photonic crystals” and work in a similar way to opals. Light goes in the structure and gets bounced back out in all directions, to be noticed by our eyeballs. This little Green Hairstreak Butterfly (Callophrys rubi), not only uses the gyroid structures to made its vibrant green scales, but it also uses them to produce polarized iridescence. That way, the butterfly can chill on the new spring green leaves, camouflaging from birds and mammals, and orient itself with the sun to reflect polarized iridescence to attract mates. Basically, if the butterfly is at all shiny, it uses nano-structures to produce its color. In the video below, I talk about how structural color works in other butterflies, not just these. But what if it’s not shiny? Well, on to pigments! Plants are made up of a lot of stuff. Chlorophyll, is the main green pigment that allows plants to convert sunlight into sugar and spit oxygen back out into the atmosphere. But chlorophyll can only absorb some of the necessary wavelengths, and there are other pigments, carotenoids, that are responsible for picking up the slack. You are what you eat. And I’m lutein and cis-lutein. 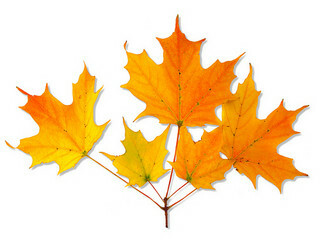 Carotenoids, and specifically a xanthophyll, called lutein are responsible for some of the green colors in butterflies. 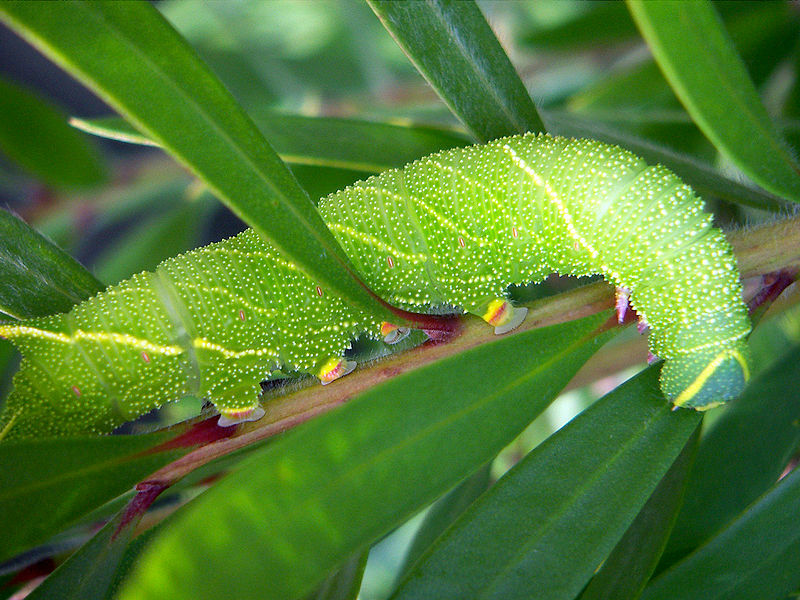 Caterpillars get the stuff when they munch on leaves and this gives the caterpillar a bright green color. Lutein, specifically, makes egg yolks yellow and is often used as a food colorant. I realize yellow, isn’t green, so how do we get green colors from a yellow pigment? Euchloron megaera presents a lovely green color made from a different plant pigment. Basically, lots organic chemistry makes cis-lutein, a transformation which is one of the ways to achieve a bright green. Many adult butterflies sport lutein in their wings and there is one other known example of a moth using different plant derivatives for coloration. 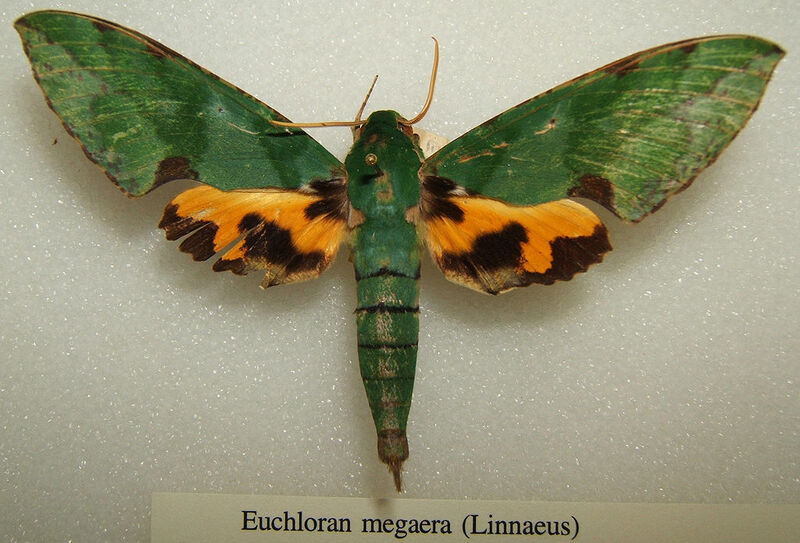 The hawk moth, Euchloron megaera, has lovely dark emerald wings, and the color is thought to be another derivative of a plant pigment (anthocyanidin). However, while using lutein, or other plant derivatives, is not unheard of, bile pigments steal the show when it comes to decorating butterflies. This is where the poop comes in. Bile, in vertebrates is made in the liver and aids in digestion of fats. While bile occasionally makes our poop green, because of a yellow-ish green substance called bilirubin, in butterflies and moths bile pigments can have stunning color effects. 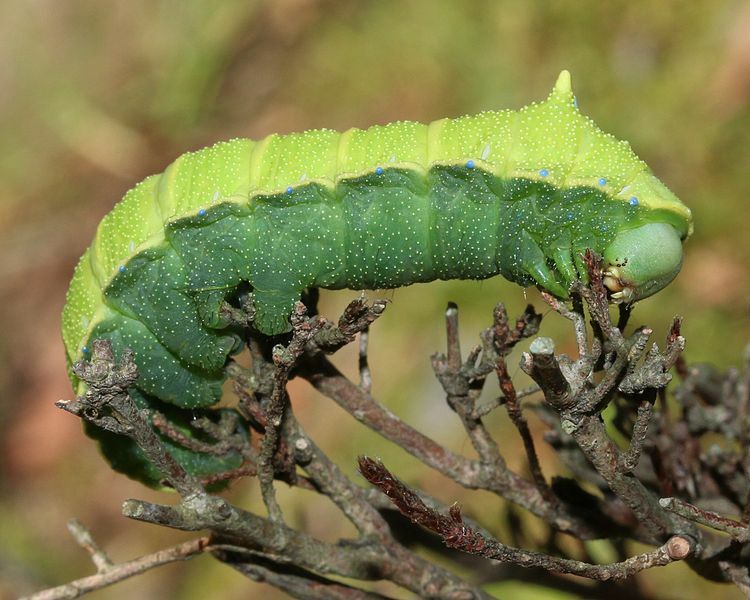 The Rhodinia fugax caterpillar that uses blue bile pigments to help make its greens. Many butterflies use lutein in conjunction with bile pigments, or just bile pigments, to make their green colors. Since luetin is yellow, the butterflies will mix a blue bile pigment with the luetin to produce a green color in both adult and larval forms. What makes bile coloration so interesting is that in most butterflies sporting this coloration, have the pigments deposited right into the wing membrane and either have specialized scales, or no scales covering that area. In some cases, the pigments are in the blood of the butterfly, and can just be seen through the wings. To the contrary, most butterflies have pigment deposited right into the scales. 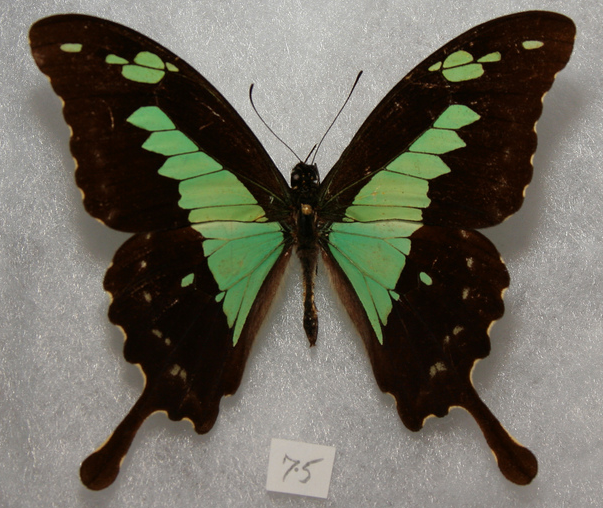 I’m the Apple Green Swallowtail (Papilio phorcas) for which the bile pigment phorcabilin was named after. 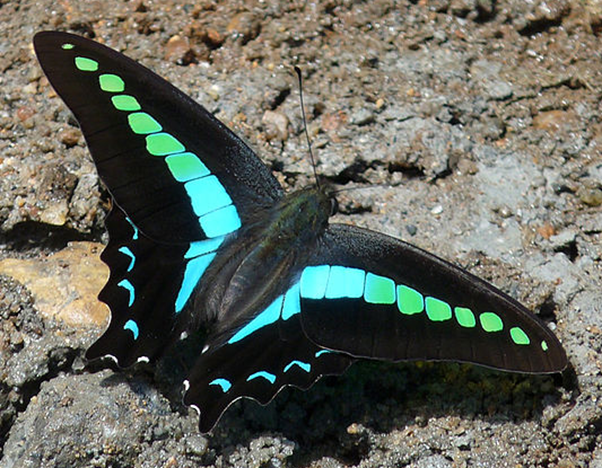 I’m the Common Bluebottle (Graphium sarpedon). The blue pigment in me is from sarpedobilin, a bile pigment named after me. The green is our friend lutein. This bile coloration occurs in many common families, including the family that our friend, the Malachite Butterfly is in (Nymphalidae). In fact, bile pigments can be found commonly in a wide variety of insects including grasshoppers, mantises, cockroaches, lacewings, leaf bugs, and spiders. Okay Okay! What About the Malachite Butterfly!? Great question!!! Looks like it hasn’t been looked into. Maybe some aspiring young researcher who’s interested in butterfly coloration can look into it. But, by deductive reasoning, it doesn’t look shiny so it’s probably not a nano-structure. Considering it’s in the family Nymphalidae, and has a stunning bright green color, I wouldn’t be surprised if it’s some sort of bile pigment, lutein derivative, or a combination of the two. 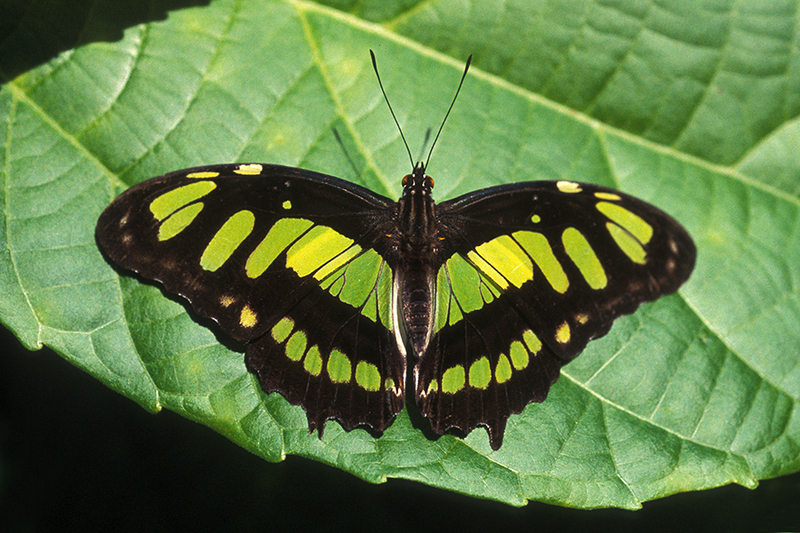 The Malachite Butterfly is really stunning, but apparently not interesting enough to warrant scientific research. Barbier M. 1981. The status of blue-green pigments of butterflies and their phototransformations. Experientia 37(10): 1060-1062. Choussy M, Barbier M, Rudiger W, and Klose W. 1973. Preliminary report on the neopterobilins, blue-green pigments from Lepidoptera. Comp. Biochem Physiol 44B: 47-52. Galant R, Skeath JB, Paddock S, Lewis DL, Carroll SB. 1998. Expression pattern of a butterfly achaete-scute homolog reveals the homology of butterfly wing scales and insect sensory bristles. Current Biology 8:807-813. Kang, SH, Tai TY, Fang TH. 2010. 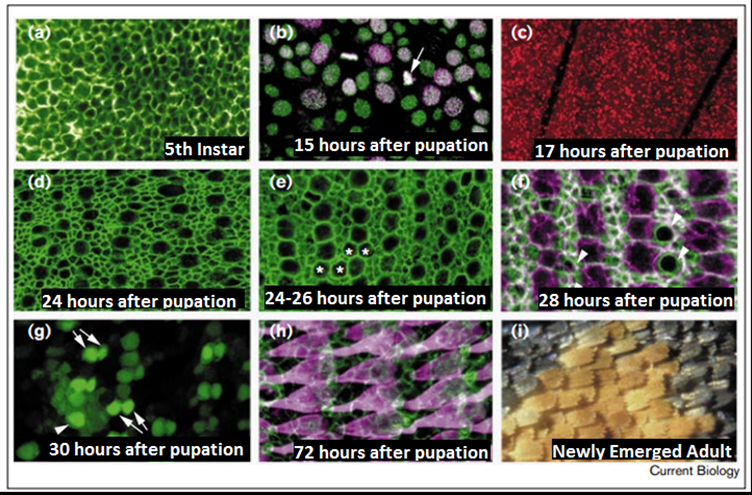 Replication of butterfly wing microstructures using molding lithography. Current Applied Physics 10:625-630. Kolle M, Salgard-Cunha PM, Scherer MRJ, Huang F, Vukusic P, Mahajan S, Baumberg JJ, Steiner U. 2010. Mimicking the colourful wing scale structure of the Papilio blumei butterfly. Nature Nanotechnology 5:511-515. Michielsen K, Raedt HD, Stavenga DG. 2010. 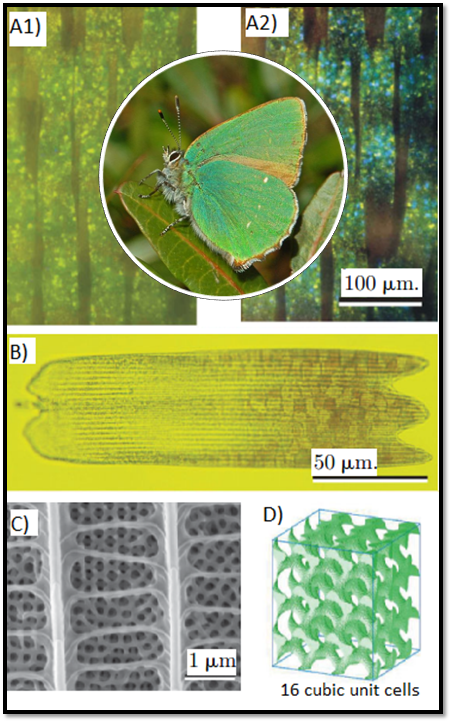 Reflectivity of the gyroid biophotonic crystals in the ventral wing scales of the green hairstreak butterfly, Callophrys rubi. Journal of the Royal Society Interface 7: 765-771. Rothschild M and Mummery R. 1985. Carotenoids and bile pigments in Danaid and swallowtail butterflies. Biological Journal of the Linnean Society 24(1): 1-14. Saito H. 2001. Blue biliprotein as an effective factor for cryptic colouration in Rhodinia fugax larvae. Journal of Insect Physiology 47(2): 205-212. Stavenga DG, Giraldo MA, Leertouwer HL. 2010. Butterfly wing colors: Glass scales of Graphium sarpedon cause polarized iridescence and enhance blue/green pigment coloration of the wing membrane. The Journal of Experimental Biology 213: 1731-1739. This entry was posted in Physiology and tagged bile, bile pigment, bile salt, Butterflies, Chlorophyll, Colors, Green, Lepidoptera, Lutein, Malachite Butterfly, nano-structure. Bookmark the permalink. 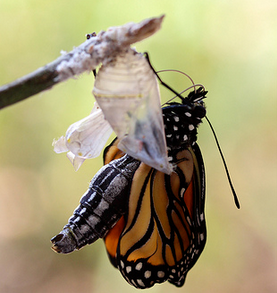 2 Responses to What do Butterflies and Poop Have in Common? They’re Green!